April | 2011 | Oh Happy Dae! 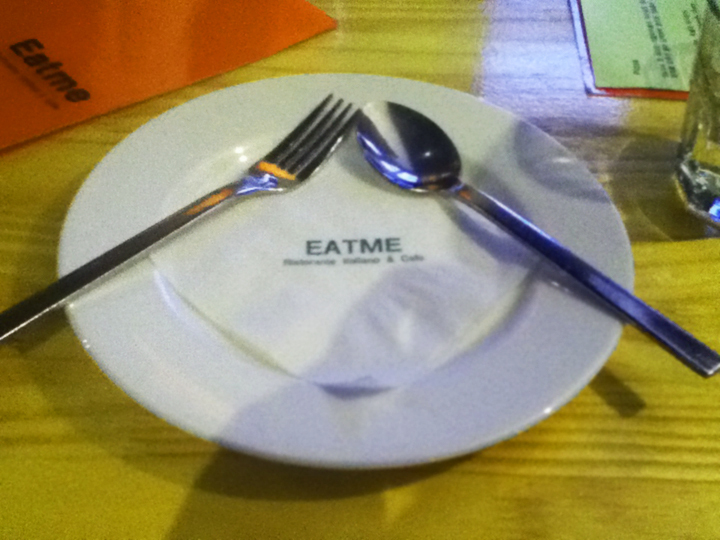 One of my favorite restaurants in Daejeon, thus far, is Eat Me near Time World Galleria. It’s an Italian restaurant located on the 2nd floor of a building, about a stone’s throw away from Yellow Taxi (one of several bars used as the hangout for foreigners). Practically begging you to eat! The decor and layout are quite simple which I don’t mind. It’s also somewhat small, so if you don’t get there early enough you may have to wait for a bit. Dishes range from about 8,000 to 13,000 won. If you really want to go all out the Rib Eye Steak goes for 31,000; however, it’s a full meal. You get soup, a sampler salad plate (with things such as gorgonzola cheese, salmon, and lettuce), and then your steak served on top of a grilled onion. Though I haven’t had many dishes yet, everything I’d had was absolutely delicious. This past week I had the Chicken Caeser Salad which was like a mountain on my plate. I also ordered the Gorgonzola pasta: cheese and cream sauce with pancetta thrown in. I was quite full, but very satisfied. Large windows overlooking the busy bar-lined street. If you want to give Eat Me a try it’s not too hard to find. Starting from Time World Galleria (the corner main entrance) walk right toward Paris Baguette. Turn left at the 1st street (go across the street) and walk all the way to the end. 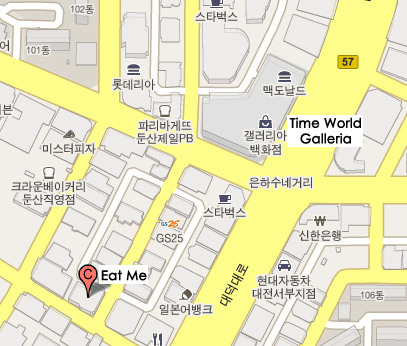 The building is on the corner on your right and Eat Me is on the 2nd floor. The stairs leading up are around the corner of the building. 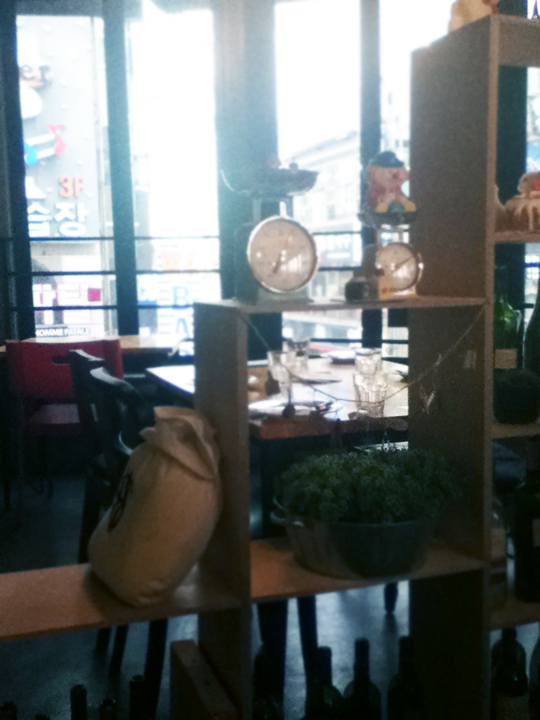 Posted in Daejeon, food, Uncategorized	by Oh Happy Dae! My friends, I have found a wonderful place. 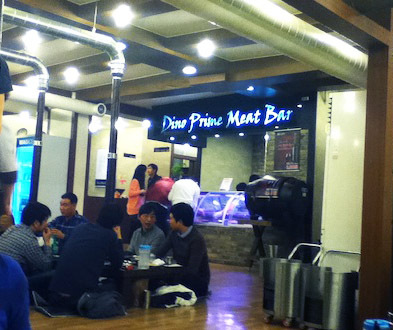 A place where, for 15,000 won (about $15 US), you shall not leave hungry. 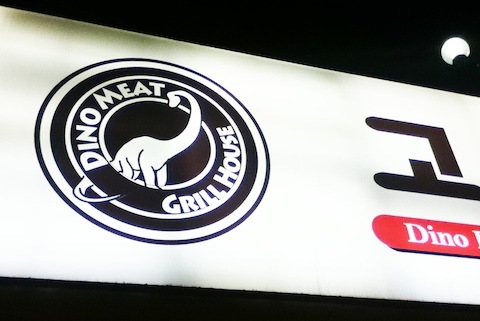 That place is Dino Meat Grill House (공룡고기) here in Daejeon. My co-workers told me about this place, and we all readily agreed to go after work this week. 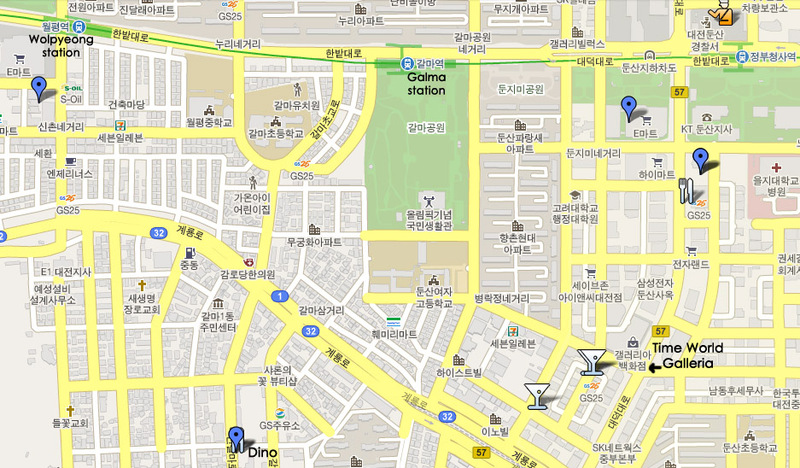 After a short walk from our place in Wolpyeong, we arrived at Dino. Interestingly, it’s right by a golfing range (cage? I dunno but it was fenced of by giant netting). 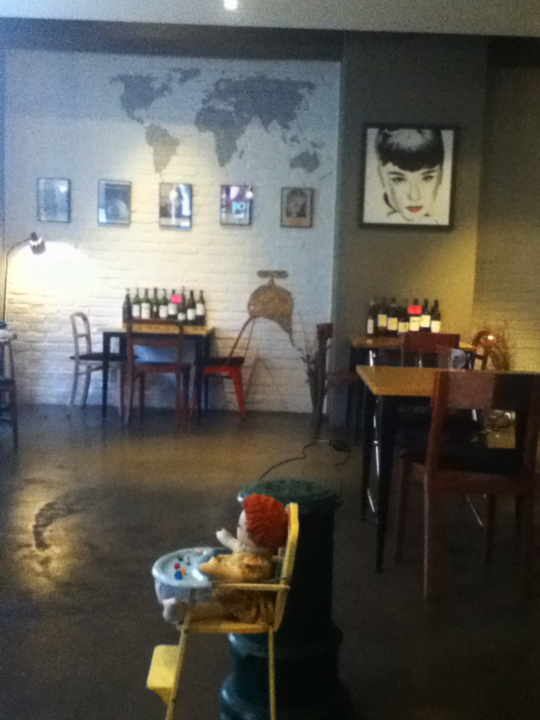 Like quite a few restaurants in Korea it’s a sit on the ground affair. I actually kind of like these places and if you figure out a good way to sit it’s not too uncomfortable. 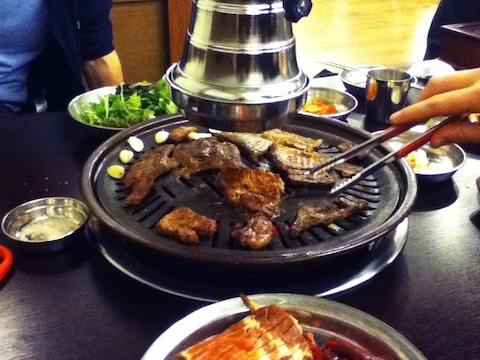 All seven of us sat down and, along with the usual countless side dishes, we were given 4 metal plates. In the front was a case with the meat in it (not unlike the kind in a deli or butcher shop), and you are free to pick whatever your heart desires. Now here’s the great part: you grill is all yourself. This is actually fairly common here. There are many restaurants with grills at the table. It’s great socially, you don’t have to wait for sunny weather to cook outside, and you don’t have to do any of the clean up! I quickly went over and picked up a fair amount of beef. I found, though, that I didn’t pick up nearly as much as my friends. I would have piled it on if I had known better. I love grilling here. You pick how much you want it cooked. There’s sauces to dip meat in. You can make your own lettuce wraps or grill kimchi, garlic, or onions. Heck, just pick it up right from the grill and eat it! The staff will usually come over at least once to change the grill plate to a fresh one, or get your fresh coals if you need it. I found myself flagging sooner in the meal than I wanted, but each bite was so delicious. I just wanted to keep eating, and for just 15,000 won it was such a steal. I don’t know how they can do that (wholesale butcher or something? ), but I love them for it. You can bet we all will be going back very soon! 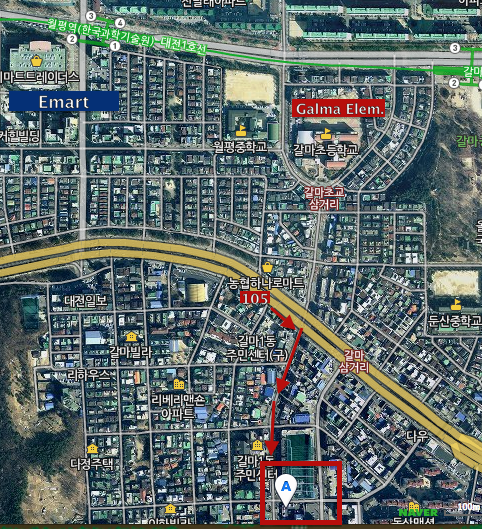 If you’re living in Daejeon and want a piece of the action, I’ve included a map of sorts. Not exactly detailed, but I marked Wolpyeong and Galma station, and Time World. It’s pretty straight forward from there. Enjoy! Here’s another map via Naver Maps. I recommend having both that and Google Maps on your phone. Sometimes you get better results searching on Naver (and using Korean). I usually walk to Dino because I live so close, but you can get close-ish if you take buses 101,105,107,116 and get off at 갈마1동주민센터 and just walk roughly 5-10 minutes.